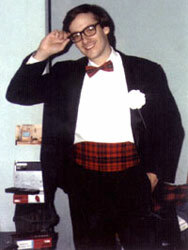 Ron Maxwell first saw THE ROCKY HORROR PICTURE SHOW in the summer of 1979 at the New Yorker Theater (now a condominium complex) in New York City, where he started performing the character of Brad Majors. One year later in the summer of 1980, he joined the cast at the famous 8th Street Playhouse in Greenwich Village. 15 years and 4 theaters later he is still performing with the current iteration of the 8th Street Cast. "That fateful night, when I went to see ROCKY HORROR for the first time, really changed my life...", he says, "definitely for the better." Throughout the years Ron has been involved in many different aspects of ROCKY HORROR in many different places. In 1981 he was playing Brad Majors at the Waverly Theater for Shock Treatment as well as doing Brad for ROCKY HORROR at 8th Street. in 1983 he took part in the first recording of the ROCKY HORROR AUDIENCE PARTICIPATION ALBUM. in 1985 he was a part of the 10th Anniversary in NYC at the Beacon theater where he got to perform on the Beacon stage as Brad. in 1992 he flew to London, England for the Transylvania '92 convention. 1995 was the busiest year of all. Itstarted in April by attending the Albany '95 convention. He played Brad Majors from SHOCK TREATMENT along with members of the Paramus Cast from New Jersey. In September he performed at the Boston Convention put on by Karen Majors and the Teseracte Players. Finally, in October of 95 he flew to Los Angeles for the 20th Anniversary. "In two nights my entire ROCKY 'career' was summed up!" he says. Friday at the Roxy he played Brad and Farley from SHOCK TREATMENT and Saturday at the Pantages, played both Ralph Hapschatt and one of the performing "Brads". Besides ROCKY HORROR Ron keeps himself busy by volunteering his time to the New York City Police Department as an Auxiliary Police Officer, and enjoys restoring and collecting pinball machines. He also has a ROCKY HORROR discussion board on America Online and can be reached at ronmaxwell@aol.com. Ron is currently working as a network technician for Scholastic Inc.